Woo hoo, my second successful attempt at making bread from scratch! 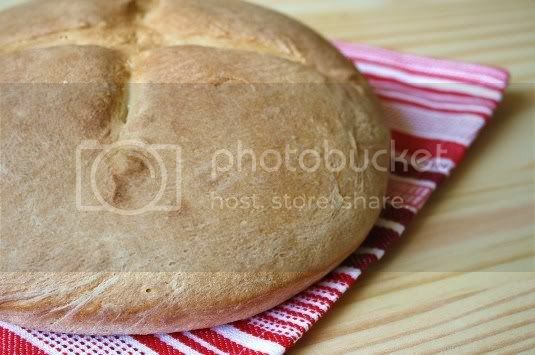 This is a good, simple recipe for a standard white bread, although the addition of buttermilk in the dough gives it a very slight sourdough flavor. First, dissolve a packet of yeast in warm water until, well, things start happening. It's actually quite fascinating to watch the yeast start to grow, sort of bursting alive like cloudy underwater fireworks. Add this to warmed buttermilk and honey, then stir into a mixture of flour and salt until a dough forms. Now here comes the fun part: kneading! Do this for about 7-10 minutes, until the dough is no longer sticking to your hands. 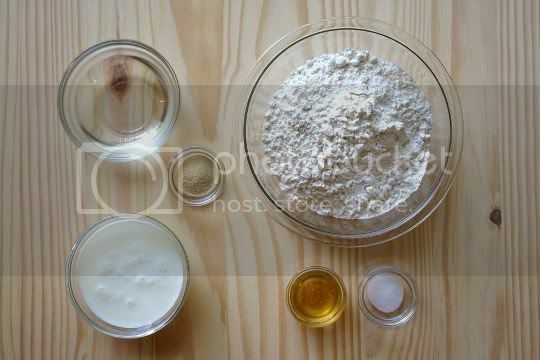 You'll need a lot of flour for this to happen, both on the kneading surface and your hands, so have it nearby. After it's gone through the double-rising process, shape the dough into a mound, slash the top, and bake for about 35 minutes. The finished product is chewy and dense, yet with a flaky and delicate crust, which makes this great as toast. 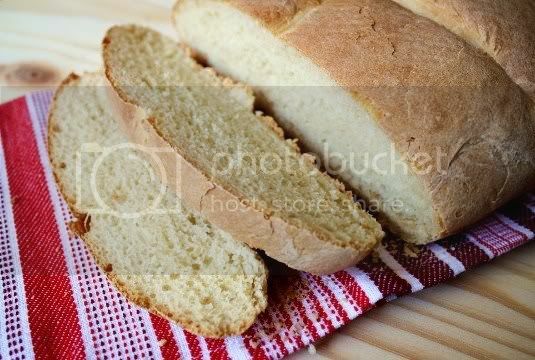 The bread is slightly tangy and slightly sweet; all this needs is some butter for rich, creamy saltiness. This freezes well, which I'd recommend as to prevent room temperature mold or refrigerator drying out. Simply thaw on the top of your oven for about 15 minutes, slice, toast, and serve! Make again? If I needed to bake bread from scratch (and had some leftover buttermilk), yes. But I still think it's so much easier to just buy bread from the store! Vegan variation: Use a buttermilk substitute and alternative liquid sweetener (if honey isn't your thing).